The official race review for Big Shoulders 2013 was titled “Splitting the Uprights”. This reference to the first week of Bears football really was about the perfect conditions on Ohio Street Beach. The National Weather Service had issued rip tide warnings for the Thursday and Friday leading up to the Saturday swim. On Saturday, amazingly, the winds died. The sun came out. The water temperature came in at a wonderful 72°F. The morning air temperature started in the low 70s and ended in the 80s. The water was glass– calmer than I have ever seen it. Much calmer than last year. And then this morning, the day after the race, the National Weather Service issued a fresh set of rip tide warnings. Friday: Scylla. Sunday: Charybdis. Call me “Odysseus”. This year I came to the race as a veteran. I’ll admit to some degree of anxiety, but this year I told myself I’d done it before. This year was not just about completing, but about competing. Improving on last year. Hitting my goal time. Improving my position in the placing. It was also my only competitive event this year. I didn’t swim the State meet in Glenview. Or any other meet for that matter. This was it for me. And I wanted to do well. I learned a lot from last year. 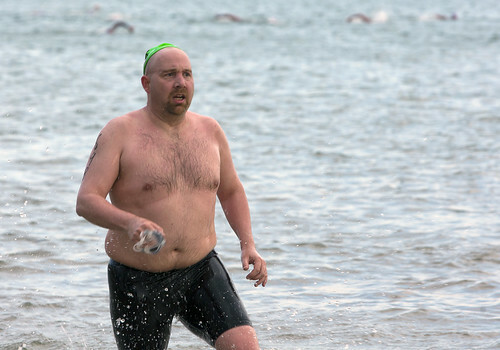 I anticipated the chaos of the start and the importance of swimming straight– particularly on that first leg out to the breakwater. My sighting was better. I was able to draft for some stretches. My pace felt comfortable. Training and practice paid off. This personal best was 8m40s faster than last year. I moved up 91 places overall, 14 places in my age group. I pushed it on the last leg heading back to the beach, and I came out of the water looking like this. Again, I want to thank Whirl and my mom coming out early in the morning to cheer me on and take photographs. And another thank you to all my friends and family who gave their support over the year. I’m planning on doing it again next year. 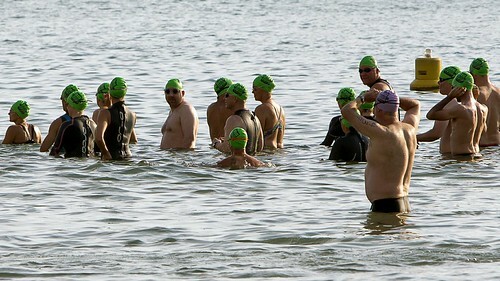 I LOVE being there first hand to cheer you on and hope I help a bit in your gigantic swimming endeavors. Maybe next September I can make it 3 in a row. Congratulations!